Did you know that Facebook recently introduced a new method that allows you (and social visitors) to check your Page’s quality history? You can read the full announcement here. If you check your admin menu at the top of your page, click the More button, and you’ll find the “Page Quality“ tab. Under this tab you’ll see any violations that the page has incurred, including content that has been removed or rated as “False, Mixture, or False Headline“. For the time being, this only applies to organic content. What won’t be included in this report are content “violations“ and removals for things like spam, clickbait, or IP violations. 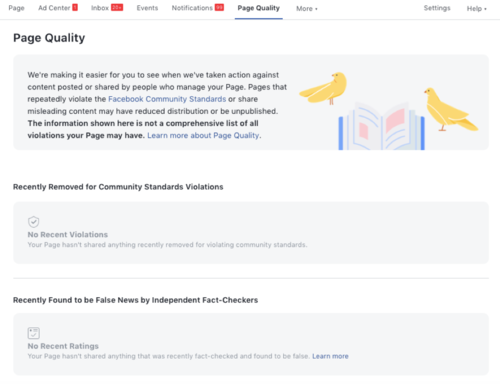 Over the past few months, we’ve spoken a lot about understanding Facebook’s Community Standards and policies, which can be notoriously “hazy“ to make sense of. This new “Page Quality“ metric can be extremely useful in navigating those slippery grey areas. By proactively keeping an eye on this new metric content publishers will be able to make better sense of our relationship with Facebook and also get some guidance as to where we need to step up our game to be more “compliant“. Also, for now Page fans or followers can’t (yet) see this data. But once they can view it, your reputation will be laid full bare in the public eye. More importantly, Facebook is also taking a stronger position against Page administrators moving to new Pages and accounts after they’ve been removed for violating Community Standards. Moving forward, Facebook may also remove associated Pages and Groups, even if they’ve not met the threshold for “unpublication“. This will apply in instances where Pages have the same administrators or even if they share a similar name to the Page that has been removed. Right now, Pages and personal accounts are affected. But it is very likely that Ad accounts and Business Managers could soon be included. It’s clear that Facebook is continually coming up with new ways to enforce their Community Standards and Policies. This new metric is just one of the ways to ensure that Pages are stepping in-line. In addition, people and Pages that are associated may also trigger cascading removals. So be careful about how and who you have managing your pages (and ad accounts) moving forward.